In April 2015, when I was in the early stages of writing Searching for the Lost Tombs of Egypt, I took a little field trip to Saqqara to look for the tomb of a man who, legend has it, was the architect of the first pyramid, a man who became a god and gave his name to a Hollywood bad guy. I was going to look for the tomb of Imhotep. I had no expectation of finding it of course – a lot of better qualified people have spent much longer than a day trip would allow trying and failing to do so, but I wanted at least to go and have a look at the northern part of the site where, for various reasons, his tomb is thought to have been. The trouble is much of the evidence is completely invisible on the surface, buried under the sand. I was looking for several very large Third Dynasty mastabas in and around the area of the Sacred Animal Necropolis (SAN) which was discovered by Bryan Emery on behalf of the Egypt Exploration Society (EES) in the 1960s and, though little known despite its importance, is visible. ‘Mastaba’ is the Arabic word for the kind of platform or bench commonly found to this day outside Egyptian houses, where members of the household sit to while away the day or to chat. It’s also the name given by Egyptologists to a particular kind of tomb with a superstructure of roughly the same cuboid shape but on a much larger scale. These evolved out of the simple mounds overlying shallow tombs that constituted the earliest monumental burials in Egypt. By the time of Imhotep and his king, Djoser, in the early Third Dynasty, the grandest were giant, rectangular mudbrick buildings rising to ten metres in height and over fifty metres in length, and incorporating numerous chambers and little niches where offerings could be placed and rituals performed. The bigger the mastaba, the wealthier or more important the individual buried there, we assume. The largest of a group of five such monuments at Beit Khallaf in Middle Egypt gives you a good idea of the size and shape. There are dozens and dozens like this at Saqqara, some completely unexcavated. There’s an awful lot you can see when you go to the site, but there’s an awful lot more that you can’t. I wanted to go and get closer to some of the things you can’t see, which I also suspected wouldn’t be well-known even to the local inspectorate, so it was obvious that I was going to have to give some thought to how I was going to find what I was looking for. In the event the trip led my was very good fun even it led my two companions to think I was crazy; more importantly it enabled me to take several photos that eventually made their way into the book, and so I thought it might be worth explaining what I did. My idea was this: if I could take a smart phone or other GPS-enabled device I thought I ought be able to walk out into a featureless desert and still have some idea of where I was. Furthermore, if that device had a data connection and was able to display my location on a satellite image or map, and if that map could be annotated with the position of the monuments I was looking for, I would be able to say when I’m standing on the spot (as in ‘X marks…’) even if nothing was visible on the surface. So, first of all, I spent a day or so in the library at the EES poring over the published archaeological maps, then staring with equal intensity at Google Earth to see which, if any, of the main archaeological features at Saqqara I could see on the satellite images. I also did the same thing in reverse, looking for archaeological features in the satellite images and trying to identify them on the maps. To my delight the main temple area of the Sacred Animal Necropolis showed up very well, which was exciting in itself: the SAN is one of the most important sites in the EES’ history – I was Director of the Society at the time – and yet it’s well away from the parts of the site that are frequented by visitors and I had never been. I knew that two of the most important mastabas for my search, numbers 3510 and 3518, lay in the same area. One, 3518, was very visible in the satellite images so I was able to drop a virtual pin onto that location; 3510 was totally invisible however. The structures that weren’t visible, at least not clearly, were more of a challenge. In those cases I had to improvise. It wasn’t the most scientific of methods but I came up with the idea of re-sizing the satellite image to the same scale as that of the published maps, and then, using the scale given on the latter, measuring the distance from something visible on both, e.g. SAN, to the mastaba I wanted to locate, and transposing the invisible line between the two from the printed map to the satellite image. I then dropped another virtual pin onto the satellite image at the appropriate spot, having again squinted even harder at it this time looking for suspiciously rectangular shadows. Not the most accurate way of doing things perhaps but I thought it would give me a decent chance of identifying any vaguely visible mudbrick on the ground that might have been part of what I was after. I also knew that in case where there really wasn’t anything visible at all, precise accuracy wouldn’t be that helpful anyway, as there still wouldn’t be anything to see, but knowing I was in the right area, close perhaps, would be enough. The result of all of this was the map you’ll find here, and this is what I took with me to Saqqara. Once I arrived in Egypt, however, I realised there would be a few further technical obstacles to overcome. Firstly, for some reason, maps like this one, although created in Google Maps via a web browser, could not at the time be viewed in the Google Maps app for iOS, meaning I would not, as I had hoped, be able to open the map on my iPhone / iPad and simply watch myself as a blue dot wandering towards the virtual pins on the map. In order to track my movements I would instead need to open the map in a web browser, which would allow me to see where I was in relation to any landmarks visible in the standard version of Google Maps, but not my custom map with the important locations marked. I decided the best I could do would be to take screen grabs of the annotated map while online, and then flick between the two – Google Maps to see where I was, and the screen grabs for comparison with the location of the archaeological features once I knew I was in the right area. Then of course I could start to look for evidence of the features on the ground – any mud brick peeping through to the surface etc. As a backup, I also bought a GPS unit for my camera which I had hoped would allow me to pinpoint my exact location of each photo I had taken once I was back at my desk. On-site I would use my iPad (bigger screen than an iPhone, easier to see though not that easy in very bright, direct sunlight…) to get me as close as possible, and the location of the photos to check once I was back at home and online. And so, in April 2015 I set off for Saqqara with Essam Nagy of the EES’ Cairo Office. On arrival we were warmly welcomed by colleagues from the local Ministry of Antiquities inspectorate. Mohamed Youssef Morsy showed us an Archaic Period mastaba close to the southern end of the North Saqqara plateau which he had recently excavated. Following this another member of the inspectorate, Tamer Radwan, accompanied us on our mission to try to find the locations I was looking for. A number of the archaic mastabas are still very visible along the edge of the escarpment overlooking the Nile Valley, which was very encouraging. Wandering northwards across the desert, the Main Temple Complex of the Sacred Animal Necropolis was easy enough to find which was quite a thrill. This would have been a very sizeable and busy area devoted to the maintenance of the cults of various gods in the form of sacred animals – ibises, baboons, falcons, cows and others – mummified examples of which were buried in huge numbers by visitors hoping to gain the favour of these deities, in the vast network of catacombs the ancients cut out of the bedrock underneath the plateau. Emery’s excavations revealed not only the catacombs, mummies, and temple area but a vast quantity of material shedding light on all aspects of life from the Late and Ptolemaic Periods during which the site was in use. Despite the importance of the site it is little known and hardly receives any visitors now, which added to the thrill of course. Mastaba 3518 is quite close to the Main Temple Complex and was also quite easy to see, a huge mass of mudbrick emerging from the sands. I was much more reliant on the satellite maps to locate 3510 but I was satisfied that I had come close enough to this one and two further mastabas which it has been claimed may be potential candidates for Imhotep’s tomb but are totally invisible having only ever been spotted in an image of subsurface remains produced by a geophysical survey carried out in the early 2000s. The brief survey complete, Essam and I took the opportunity to visit ‘beit Emery’ the house built by the great excavator and continued to be used by EES teams until it was passed over the Ministry of Antiquities for use as a storage facility a few years ago. Along the way we found some of the light-gauge railway cars he and other archaeologists used to carry vast quantities of debris away from their excavations. They were just dumped near the house he and later EES teams lived in, and had started to disappear beneath the drift sand, rapidly becoming yet another layer of the history of the site. The full story of Emery’s ‘quest for Imhotep’ forms the first chapter of Searching for the Lost Tombs of Egypt which will be published by Thames and Hudson on 11 October 2018 (pre-order here). The photos I took during the trip are here (Facebook), and displayed with their precise positions on the map, here (Google Maps). Just a quick update following my previous post on the black sarcophagus discovered in Alexandria in July (2018). The results of the first investigations into the three skeletons discovered when the sarcophagus was opened on 19 July* have now been made available. They represent the bodies of a young woman of perhaps 20 to 25 years, and two men, one who died in his 30s, and the other in his 40s (as reported e.g. in ahramonline and The Indepenedent). The elder man’s skull exhibits a round cavity which seemed to have healed over prior to death, and may be evidence of trepanation. Perhaps more interestingly (I’m not a specialist in human remains) the sarcophagus did, it turns out, contain a little ‘treasure’ after all, in the form of a gold object of uncertain type, and three gold plaques, roughly square in shape measuring 3 to 5 cm across. The four gold objects discovered inside the sarcophagus. Copyright Ministry of Antiquities, taken from ahramonline. Each of the plaques is decorated with a simple motif in low relief, apparently applied using the repoussé technique (hammering the design from the reverse side). One appears to show the pod of an opium poppy, the second something like a palm frond or perhaps an ear of corn (as suggested via LiveScience), while the third shows a coiled snake. It has been proposed (here) that the designs relate to military rank, but the snake immediately put me in mind of the agathodaimons – beneficent snake demons – flanking the entranceway to the main tomb at Kom es-Shoqafa. The iconography isn’t quite the same but it’s an interesting connection with perhaps the best known tomb in Alexandria. 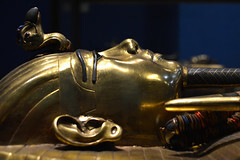 The black sarcophagus lid being wedged open. Copyright Ministry of Antiquities, taken from Luxor Times. You’ll find more on the opening of tombs, robberies etc in my book, Searching for the Lost Tombs of Egypt, which will be out in October. For more info or to pre-order please go here. The Trust has been around since 1988, quietly going about its wonderful work – providing students and scholars with accommodation in London. Until 2015 it had been run by its charismatic Founder, the musician and Egyptologist Dr Robert Anderson. But Robert died in November that year, prompting an outpouring of tributes from his many friends, colleagues and students around the world. Robert was a great man, admired by many, and he left many legacies – his writings, the students he taught, the friends to whom he passed on his enthusiasms, the organizations he founded, and the ones he led including the Egypt Exploration Society. But the Trust might just be the most enduring and important of all the gifts he left behind. Since Robert’s death the Trust’s work has continued, largely thanks to the dedication and hard work of the Coordinator, Howard Davies. I was taken on as Director in November 2016 and at around the same time, Stephen Stuart-Smith was appointed Chair of Trustees. Having had to re-group following the loss of the Founder, and with a new team in place, we are now ready to embark on what feels like a new era in the life of the Trust. Earlier this week we held a small celebration at the Kensington house to gather friends of Robert’s and of the Trust, old and new. One of Robert’s many talents was his ability to bring people together, and he did this to the benefit of his own work, and that of the organisations with which he was involved, and also as a means of helping others. We wanted those who knew Robert, and his house with all his books, musical instruments, and its atmosphere of great learning and culture, to remember him, and to share memories with one another, and particularly with those who did not know him so well or even at all. We wanted to refresh and extend Robert’s own network, and to inspire new friends to continue to remember his work, and to know, support and spread the word about his Trust. This autumn we will be inviting applications for visits to London in 2018. Please take a look at the website, get to know the Trust’s story and its current work, and to imagine how we might develop what we offer in future. Please follow us via the website, Facebook, Twitter or Instagram, or by dropping us a line here to add your name to our electronic mailing list. Let us know what you think or if you have any questions. We’re looking forward to making your acquaintance. Searching for missing tombs.. Come with me? UPDATE 12 April 2017: The tour described below, departing 29 October 2017 has now sold out. However, a second tour is now planned for 6 – 19 March 2018 – for further details please see here (links below have also been changed). I’ve been writing a book about so-called ‘missing tombs’ for a while now (and hoping to get it done in time for publication in Spring 2018 at the latest, by the way). So when my friends at Ancient World Tours (AWT) got in touch to ask if I’d like to take a group to Egypt and, if so, which sites I’d like to visit, going on the hunt for some of these tombs seemed like the obvious thing to do. Now, before anyone gets over-excited, we’re not going to go blazing in waving trowels around or thrusting shovels into the sand – sorry! – this is more about visiting the sites and examining some of the objects that tell the story of where some of these tombs – of Imhotep, Nefertiti, Cleopatra and others – might be. The Step Pyramid isn’t difficult to find(! ), but might the tomb of its creator, Imhotep, also lie nearby somewhere? Janet Shepherd and co at AWT have been hard at work planning the trip and figuring out the logistics, and I’m delighted to say the tour has now been advertised (and the first few places already taken). All the info you need is here. 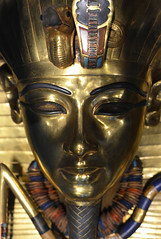 The coffin discovered in KV 55 has raised more questions than it has answered. Who was it made for? For whom was it then repurposed? And which of the Amarna royals that didn’t end up it might yet be found elsewhere? Last week I spent two absolutely wonderful days at Tell el-Amarna. I was looking forward to visiting, but I’d been a couple of time before and didn’t think much of it. Been there done that, know it all already… But it made a much bigger impression on me this time round. Amarna was and is the capital city founded by Akhenaten and Nefertiti, and the setting, therefore, for one of the great stories of the ancient past. That city, Akhetaten, as Akhenaten called it, was also a place where a lot of ordinary people lived – and worked, played, loved, met, talked, argued, got sick, got well again, died, were buried, and did all the other things people do – together, in this one place. It’s also set in an extraordinarily beautiful, archetypally Nile Valley landscape: the broad river with lush green fields punctuated by palm trees at its edge, then a crescent of desert plain bounded at its eastern extent by a glorious arc of cliffs that marks the edge of the valley and the beginning of the high desert nothingness beyond. Satellite image of the site showing the essences of the geography at Amarna: the river and, to the east, the cultivation, low desert plain, great arc of cliffs, high desert beyond. The site is also home to the people of the modern village of Et-Till Beni Amra whose name was corrupted and became ‘Tell el-Amarna’ the name we know the site best by today. Further to the south of Et-Till are the villages of El-Hagg Qandil, El-Amariya and El-Hawata esh-Sharqiya (or El-Hawata). People lived here in the time of Akhenaten, and people live here now. I was there to help make a documentary with a crew, Nick and Lina, from Blink Films and with our expert contributor, Dr Anna Stevens. We filmed at the north cemetery, the Workmen’s Village, and two unfeasibly lovely riverside locations; we ate two delicious and very Egyptian lunches at the local resthouse; and we drove and hiked around the site inbetween times, all the while getting the benefit of Anna’s expert knowledge and guidance. One of the first buildings you see on the desert is the ancient house which was rebuilt by the Egypt Exploration Society’s team in the 1920s for use as a base during their excavations, most famously those led by John Pendlebury and co from the beginning of the 1930s. The EES house while it was still in use. Photograph taken during the 1933-4 season at the site, reproduced courtesy of the Egypt Exploration Society. The ruins sit in and around clusters of modern houses, cultivated land, a cemetery – all the elements you would expect of any settled area, and all of which are expanding rapidly in an easterly direction across the desert, eating into, and destroying, the remains of the ancient city. It’s sad from an archaeological perspective, but people need houses to live in, fields on which to grow their crops, and somewhere to bury their dead. Amarna is all about people – ancient and modern – and their stories. The site helps us to tell the tale of Akhenaten and Nefertiti, but the current Amarna Project has focused more on the unrivalled opportunity it presents to study a fully-fledged, purpose-built city at a very precise moment in time: Akhetaten came into being in just a few years, according to Akhenaten’s very deliberate plan; and it was abandoned again almost as quickly after the end of his reign, as part of the transition back to the old ways. Crucially, the desert plain on which the city was built was never reoccupied to anything like the same extent, and the remains of the city simply lay there largely undisturbed beneath a thin layer of drift sand for a few thousand years until explorers and scholars began to take an interest in the beginning of the 19th century. Along with literally thousands of buildings and material objects the city also provides the opportunity to study the people who built the whole thing, and made it work. For many years, although the richly decorated rock-cut tombs of the Amarna elite were well known, the cemeteries of the ordinary people lay undiscovered. This changed in recent years with the discovery of what have become known as the south and north cemeteries. Anna was with the crew and me in part to tell the story of the excavation of these crucially important burial grounds which began in 2006. During a first visit to the north cemetery for a reccy, she told us how privileged she felt to have the opportunity to excavate the graves of the people of Akhetaten. The very human connection she feels with the ancients was clear, and it now seems obvious having spoken to Anna just how incredible it is to be able to get to know something of these people’s lives, and how each came to an end, often at very young ages, perhaps after some suffering from illness or over-work, from the careful recording and interpretation of their graves and remains. Thinking about the people – who, though far removed from us in terms of time, geography, beliefs etc., were nonetheless people just as we are – set me thinking about the city in quite a different way, made it feel a little closer, a little more alive. It’s difficult not to see a connection between this and the friendly relations Anna has with so many of the people, villagers, dig-house staff, antiquities inspectors, police, and guardians who live and work at Amarna now. Some many lives intertwined… People, ancient and modern, locals and foreigners… City, villages and landscape. It’s such a special place, one of Egypt’s great places, one of the world’s great places. And yet the archeological site is disappearing as the locals have no choice but to make use of it for their own needs. The local Ministry of Antiquities inspectorate and Amarna Project are desperately under-funded, despite the celebrity of Akhenaten and Nefertiti. A single fragment of a statue of the period was due to be sold at auction recently for $600,000; an entire season of excavation and conservation work costs a tiny fraction of that and yet the Project struggles to find the funds it needs, relying on small grants and crowd-funding. Listening to Anna, with all her knowledge expertise, energy and passion, and seeing the excellent relations she has with friends and colleagues all around her, one can be hopeful that in future the ancient city will be preserved in its (still, largely) unspoilt desert landscape, and that the modern inhabitants will be able to able to live good lives in and around it without threatening that. But it’s by no means assured. Satellite image of the Central City at Amarna (click here to view the area in Google Maps). The massive rectangular enclosure of the Great Aten temple has recently been built over by the buildings of a modern cemetery (small rectangular shapes towards the top of the image). The dark green cultivated areas at its north-eastern corner demonstrate the extent to which the desert can be reclaimed for agriculture, threatening to envelope the temple completely. I wanted to write something to share my excitement at waking up to these stories – of the ancient people, their modern counterparts, and the incredible work (Project Director) Professor Barry Kemp, Anna and their colleagues are doing – but also to say something about the urgent need for us not to be complacent about this wonderful place. Please read more about the site and the Project (here), and please consider supporting it if you can (here). So, I have new role… I am delighted to announce that I have been appointed Director of the Robert Anderson Research Charitable Trust (RARCT) with effect from March 2017. Up to that time I will be learning the ropes as ‘Director designate’. The Trustees’ announcement is here. The Trust is a wonderful organisation whose work I have admired for some time. Its purpose is ‘to offer postgraduate students and visiting academic staff accommodation and financial support for short periods of intensive research in London’. Since its establishment in 1989 it has brought dozens of students and scholars, mostly from the Middle East and Eastern Europe, under its wing in London, providing them with the opportunity to make use of specialist libraries and the Trust’s network of academic contacts to further their studies. Many of its visitors have been archaeologists from Egypt, reflecting the founder’s interests, and indeed its work provided some of the inspiration for the Egypt Exploration Society’s programme of scholarships, which I helped to establish in recent years. The Trust’s founder, Dr Robert Anderson, was an extraordinary man, of wide-ranging interests, and many and varied talents. He was an Egyptologist and also a musician, equally at ease whether reading a hieroglyphic inscription or conducting an orchestra. Robert was also a friend of mine and a great source of inspiration and encouragement to me in my work. When he died last year, aged 88, but still very actively involved in the work of his Trust, tributes poured in from his many friends, colleagues and students around the world. My own was published in Egyptian Archaeology earlier this year (and is reproduced here courtesy of the Egypt Exploration Society). He left behind a rich legacy in the books, articles and other works he wrote, in the many students whose lives were enriched by his teaching, and of course in the Trust. I’m really excited to have been given this opportunity. The Trust’s work is rooted in values which one could be forgiven for thinking are becoming lost in today’s world: the exchange of ideas between people of different nationalities and cultures, particularly those coming from some of the most troubled parts of the world; an emphasis on knowledge, scholarship and expertise, particularly in the arts and humanities; and the provision of accommodation in parts of London that are increasingly reserved only for the very wealthiest in society. In these difficult times, the value of this work seems likely only to increase. I can’t wait to get started and look forward to sharing more of the Trust and its work with you as we go along. A little while ago, Dr Who writer, information goldmine, and pal, Simon Guerrier, sent an unusual question to mission control at the EES: when did the Daleks’ visit to ancient Egypt in the epic story The Daleks’ Masterplan take place? There is no official line but I thought I could give Simon a view, so I set about watching the one episode in question, and made a few notes. I had suspected the designs would be too bad for it to have been clear what dateable sources they were based on, but in fact they were pretty good. It’s just unfortunate that the sources used range across a couple of millennia of Egyptian history, leaving the Egyptologist shouting ‘the Egyptians never…!’ and ‘anachronism!’ at the TV a few times… Still I managed to give Simon a date and thought the evidence I used to make my case might be of interest. The room is cluttered with treasures, as in the tomb of Tutankhamun (reigned 1332-1323 BC, late 18th Dynasty) when it was first discovered. The pair of ears(?) in this shot recalls the glorious reclining Anubis buried with the boy king. Image (copyright, The Griffith Institute, Oxford and gloriously reconstructed in colour by Dynamichrome) taken from here. The supposed mummy here is in fact the story’s bad guy, the Meddling Monk. The humour in our heroes’ realisation that they are not about to be menaced by the living dead after all, is intentional, but the flimsy metallic appearance of the coffin presumably isn’t. 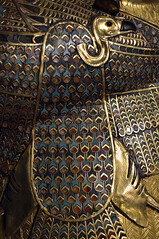 The design on the outside isn’t bad, however, and recalls coffins characteristic of the Middle Kingdom (2000-1700 BC), such as this one now in the Metropolitan Museum of Art, New York. I got quite excited at this point because of the very visible horizontal cartouche in the background. The signs seem good which is unusual for a TV / film set but I can’t quite make sense of them. I think they are a slightly fudged version of Nefertari’s cartouche, and therefore in keeping with the decoration visible elsewhere here. The beginning of the vertical cartouche with the yellow (presumably) background visible beneath, confirms it. Photo my own (at last!). This relief seems well done and has the feel of the Late Period (Dynasties 26 to 30, 672-332 BC) – but I’m struggling to find a clear parallel (can anyone help?). This kind of scene would normally, I think, be found on smaller scale, inscribed on e.g. a naos or other kind of shrine. The inscriptions, though generally well done, do not obviously give anything away. One final bit of something to go on occurs in dialogue, at approx. 10.00: “…the same mortals that build war machines that throw fire. When Hyksos returns, you’ll see the end of your.. gods.” The Hyksos were a race of foreigners who settled in Egypt during the Second Intermediate Period (1650-1550 BC) and came to rule at least the Delta and northern Nile Valley if not the entire country. They introduced horses and chariotry and other military tech which may be where the ref to ‘war machines’ comes from. ‘Hyksos’ in the story seems to refer to one individual however; the words ‘hyksos’ derives from the ancient Egyptian ‘heka khasut’ meaning ‘ruler of foreign lands’ and it may just be that this was the name given to this particular individual by the Egyptians in the story, but in that case there may be no connection with the Second Intermediate Period group. In any case the reference should probably be disregarded as a dating criterion. By the way, Simon was asking as part of some research for a forthcoming book which I’m really looking forward to seeing: Whographica by Simon Guerrier, Steve O’Brien and Ben Morris will be published in September (2016) by BBC Books.